But I can only imagine that the Swiss and other European tourists thought we were NUTS when they asked for hot chocolate back in the ‘sad old days”. I can almost picture their faces when they took their first sip. On top of the weak coffee and the insipid tea, we give you watery hot chocolate. ENJOY! Welcome to America aka HOT beverage HELL! Thankfully, we’ve been getting our hot beverage house in order and you can get real hot chocolate made with milk (or any number of milk substitutes) and your choice of chocolates and flavors. I know, I sold a lot of hot chocolate when I had Divalicious Chocolate Cafe in Nolita. I drank a bunch too. Who doesn’t love a cozy hot chocolate, especially on a cold winter’s night? 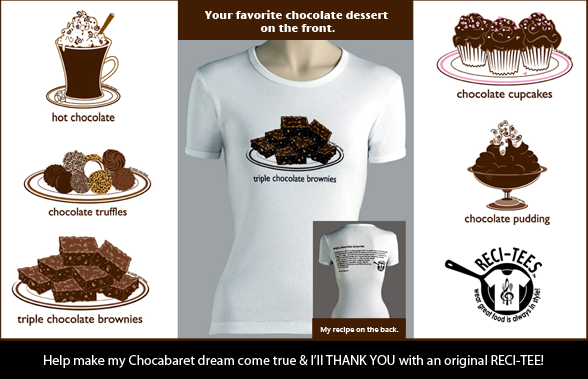 Hot Chocolate is the flavor of my original RECI-TEES—Exclusively available via my Kickstarter campaign! Cocoa matters. Use a good one to make a hot chocolate that ROCKS your mouth. In a small saucepan, mix cocoa powder, sugar and salt. Stir in milk, cream and vanilla. Add cinnamon and heat on a medium flame, stirring until tiny bubbles appear at the edge of the saucepan. Garnish each mug with whipped cream, chocolate shavings, marshmallows and a cinnamon stick. Mexican Chocolate: Add 1/2 tsp ground ancho chili powder and a pinch of cayenne (or more of each to taste), to the dry ingredients before heating. Super Chocolaty Hot Chocolate: Add 1 tablespoon high quality dark chocolate, chopped or finely ground, to each of the mugs before adding the hot chocolate mixture. I’ll be doing more cooking and singing on Google+ Circle me there!